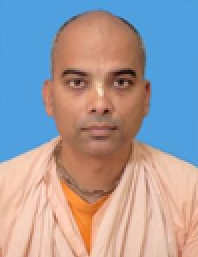 Home » People » Bhakti Vijnana Muni » Muni, Bhakti Vijnana, Dr.
Dr. Bhakti Vijnana Muni is a sannyasi (Renounced Order) in the Gaudiya Vaishnava Tradition. At present he is serving as the President of Sri Chaitanya Saraswat Institute. He received a PhD in Chemical Engineering in the year 2010 from the Indian Institute of Technology in Kharagapur. As an engineering student he took an interest in the harmony of Science and Religion and organised several keynote speeches at IIT Kharagpur on the topics of Synthesis of Science and Religion by Sripad Bhaktisvarupa Damodara Maharaja, PhD (Dr. T.D. Singh), who is his Gurudev (spiritual master). Sripad Bhaktisvarupa Damodara Maharaja was well known for organising several international conferences for the synthesis of Science and Religion and promoting a dialogue with leading scientists and different religions in the world for the purpose of finding solutions to the question like the origin of life, origin of matter and lasting peace.